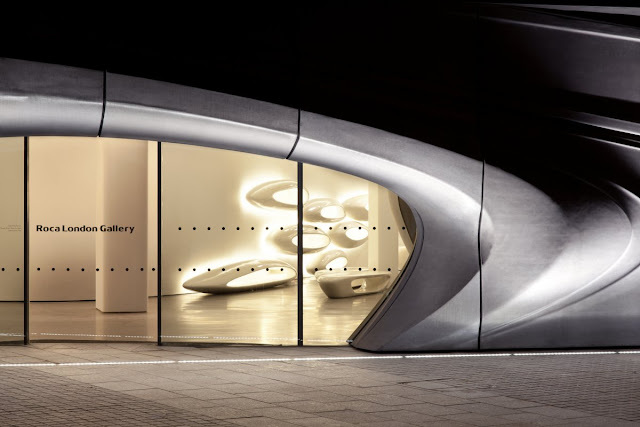 Zaha Hadid Architects, acclaimed winners of this year’s Stirling Prize, have designed the new Roca London Gallery located in the well-known Chelsea Harbour district near King’s Road. Roca is a leading global bathroom brand which, through its renowned Innovation Lab, is dedicated to developing cutting edge, technologically advanced products that continue to set the benchmark for the industry as well as to underline its position as market leader. Zaha Hadid Architects (ZHA) were chosen by Roca in 2009 to create a versatile reference space capturing the essence of the brand and its values. It is also the latest in the series of Roca Galleries globally, which include the Roca Barcelona Gallery, the Roca Madrid Gallery and the Roca Lisbon Gallery. 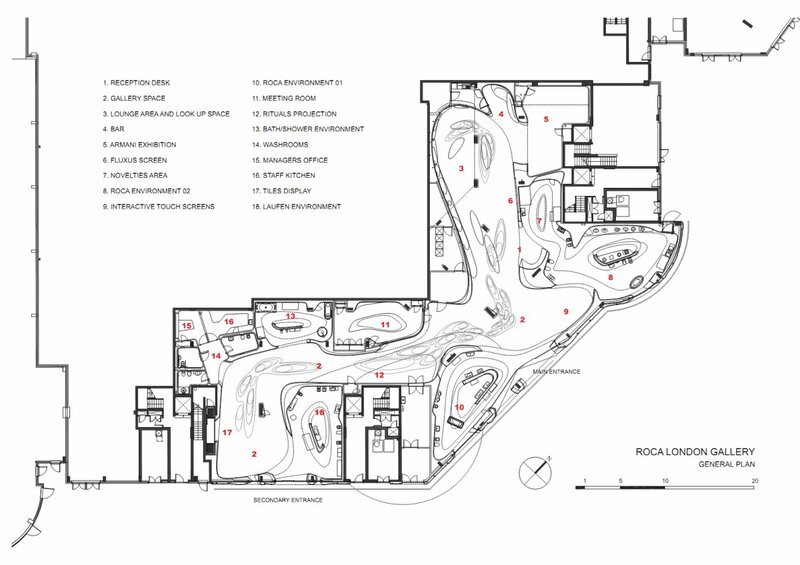 In all cases the Galleries have been designed in conjunction with architectural studios of international repute and are universally characterised by their design, quality and innovation as well as the imaginative use of materials and the most advanced interactive technologies. The Roca London Gallery expresses Roca’s commitment to innovative design, sustainability and wellbeing through an architecture that offers visitors a unique experience which is both visually and interactively engaging. Taking its inspirational cue from the idea of a space created by water in its various different states, ZHA’s bespoke design defines a flowing and porous space for the 1100m2 Roca London Gallery. The dynamic language is characteristic of the practice’s many projects globally, yet specific to the functional needs of Roca as a brand, and evolved in a bespoke manner for its purpose. With utmost precision and functionality, it integrates the latest communications technology the Gallery is equipped with in an aesthetically responsive and seamless manner. 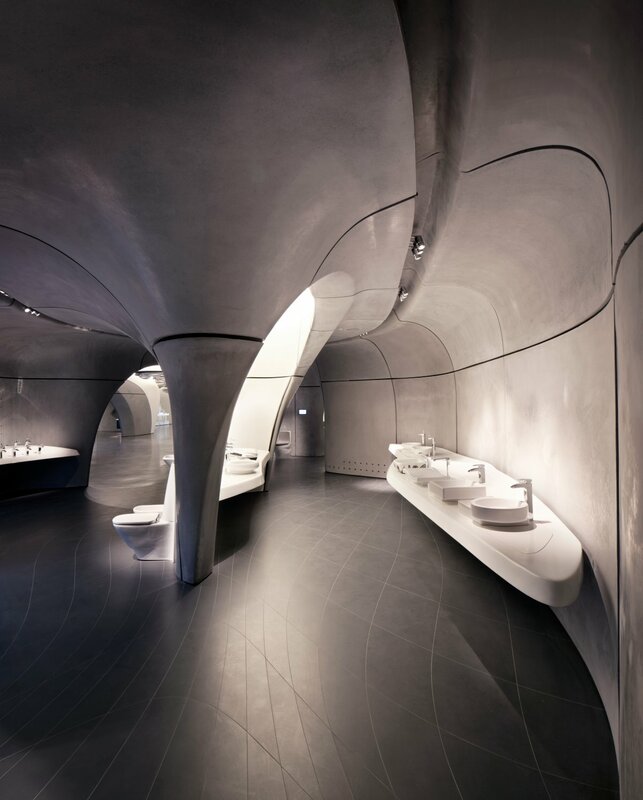 Zaha Hadid Architects have created a precisely ordered, intimate and enjoyable sensory design environment which stimulates the visitor through its active and engaged relationship with Roca’s exceptional bathroom products. The concept defining each of the Roca Galleries is to take the visitor far beyond simply researching and choosing products in order to create a uniquely enjoyable sensory experience, enabling visitors to enjoy all the qualities of the brand. Instead of a conventional showroom, the Gallery is an immersive reference space of ‘edutainment’ for the wider community capturing the essence of the brand. The Roca London Gallery is a single space of 1100m2 including connected, semi-open zones for product displays and a meeting room space seamlessly incorporating a range of state-of-the-art interactive technologies and audio visual resources. Designed as a versatile multi-purpose environment, the Gallery will host a wide range of social and cultural events of interest to Roca, including exhibitions produced in-house and externally, meetings, presentations, debates and receptions. 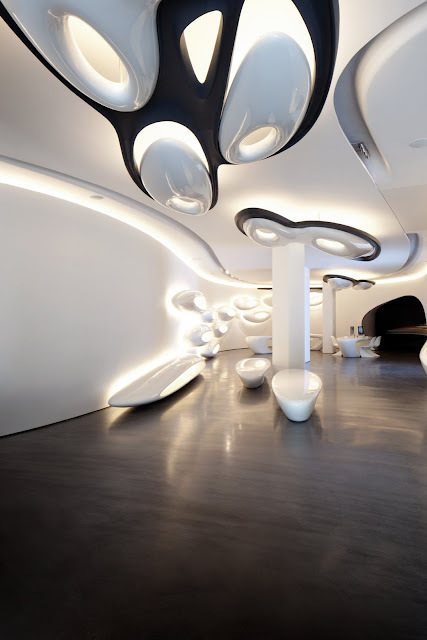 Zaha Hadid Architects has fully addressed this need for a place defining harmony between form and function in which visitors experience the very essence of Roca. The design brings about a connective language between the architecture and the bathroom products, with the movement of water ‘carving out’ the interior and moving through the Gallery as individual drops. A flowing, all-white space made of faceted GRG (gypsum) panels serves as a central axis of the Gallery. Around this a number of smaller connected semi-enclosed spaces can be viewed through openings in walls. As a result, the visitor never feels enclosed in one space, but can always see beyond it into the space through overlapping and cutaway forms that enable a pleasing permeability to the Gallery. The design theme of water movement extends to the dynamic façade of the Roca London Gallery, which appears initially to the visitor approaching the architecture like a set of ripples in movement across the exterior of the ground level space. The grey façade has large apertures for the main entrance and windows and an appearance of tactility, creating a sense of intrigue on the street as the visitor approaches. Water defines the landscape of the interior space, creating a sense of mobile liquidity reinforced by a series of elongated, illuminated water drops. These cascade around the ceiling as a set of lighting fixtures, down the walls as shelves for books, media and small products, and onto the floor as tables and seating. Their fluid lines of convergence both lend each area of the space an individual identity and connect them by the way they define a feeling of movement. All the panels, which are made of GRC, or fibre reinforced concrete and extend up to 2.20 metres in height, have been pre-fabricated in moulds and constructed on-site. The façade is made of 2 x 4 metre panels of 800kg each. The panels creating the interior walls are 6cm thick and made of two waffled concrete layers sandwiching a honeycomb mesh that can stress in different directions and is very robust as a composite material. The furniture is made from GRP, or reinforced plastic, including the cove-shaped reception desk. The lighting scheme created by Isometrix is also innovative in a complementary way, with special features including washing the walls in light and a mix of direct and dispersed mood lights. 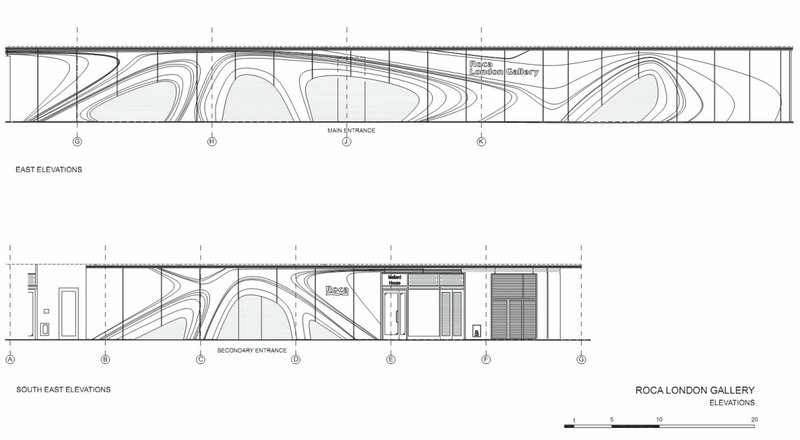 Part of the brief was to include a series of bathroom product ensembles integrated in the space, and the Gallery’s walls give way in six locations to semi-enclosed, cave-like spaces of GRC panels for the product displays, as well as to the bar and reception area. The cocoon-like meeting space has a wall of GRG, a continuation of the Gallery’s central axis. A special feature of the Gallery is the floor of the product exhibition areas, which has a mosaic of porcelain tiles designed exclusively for the space by Zaha Hadid Architects. With each one cut and laid individually, the design creates an optical effect inspired by a water current. 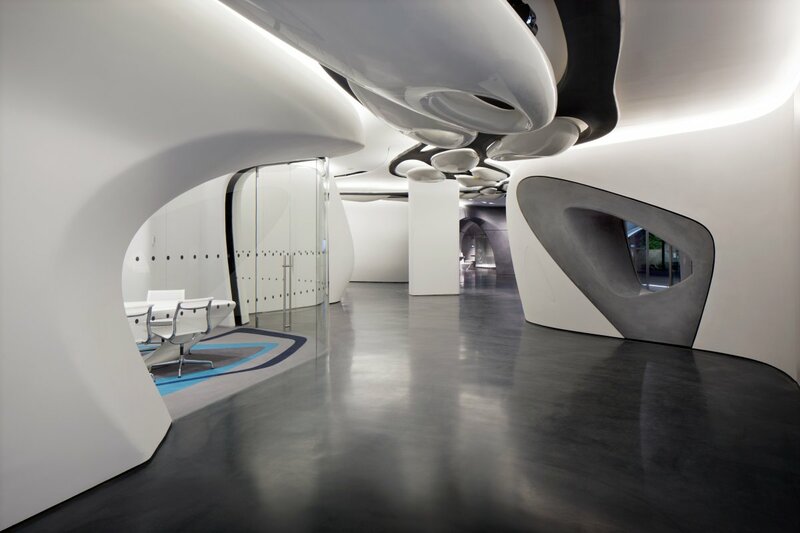 The language of fluidity and natural movement is driven by ZHA’s commitment to parametric design tools and to the creative possibilities arising from the constant evolution of manufacturing processes and techniques. Both panels and the moulds used to create them were realised via 3D modelling, and produced in a sequence so that they would be fully compatible. The architects’ geometry is akin to natural forms, with no one point in the space being projected vertically. They enjoy being challenged by this and the innate complexity of the process of bringing the design to respond fully, through modelling and testing, to very specific social functions.